← Speed Metal or Thrash Metal? Relic or relevant? Mikko Aspa’s Clandestine Blaze remains one of the more undersung projects in black metal. On initial listens little more than a homage to Darkthrone‘s trilogy of classics, there is a gravitas and a seriousness which emanates from all of this band’s recorded output. It is hard to put a finger on just what it is that Aspa does differently; City of Slaughter has a more pronounced melodic slant compared with its immediate predecessors, varying with subtlety between the long-chain, tremolo-focused battery of Transilvanian Hunger and the Hellhammer-isms of A Blaze in the Northern Sky. Increasing notice is now also taken of Aspa’s other, far more renowned project, Deathspell Omega; City of Slaughter goes back to the last conventional album released by that band, Si Monumentum Requiris Circumspice, and incorporates its penchant for well-articulated melodic phrases into the fold. The result, however, isn’t mired in the orthodox eschatology that preoccupies DsO. Aspa’s work in Clandestine Blaze is not only potent and emotional but it is also unremittingly dark, of tone and theme, and a direct extension in musical form of a genre connoisseur’s perspective on life, death, and the things we build around and in between these bookends. Routinely accused of harboring national socialist and anti-semitic leanings, Aspa’s apparent riposte to his prosecutors – and this is only my interpretation of his words, on this album and in the odd interview I’ve read – is a resounding “Yes! And so what?” The man of intelligence and conviction – and isn’t it a shame how often the two aren’t naturally allied? – measures the depth of his audience and responds accordingly. What value then in attempting to save face before one’s intellectual inferiors? If the rabble would make a devil of you, then so be it: be the devil, spread your wings, and take flight. No thinking man is beholden to subscribe blindly to the fashions and dogmas of his age; by this I don’t mean a blanket rejection of tradition, which after all is yet another dogma of the present age. Tradition accumulates over large stretches of time through trial-and-error of what works for “us” as a people, while what passes as de rigeur today is usually fickle, ill-reasoned of nature, and frequently not without something of the manipulative in it. As Aspa alludes to in this fine interview, common sense is not that common, not even in circles which we believe ourselves closely associated with, so why waste time and risk frustration searching for it in places where it never took root to begin with? 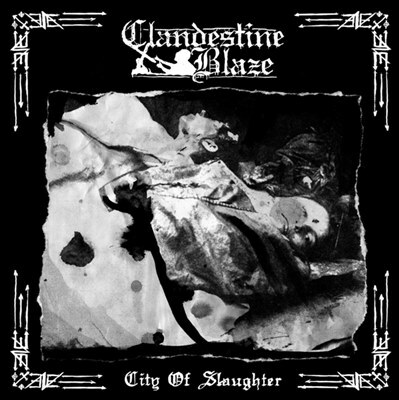 This entry was posted in Black Metal and tagged Black Metal, city of slaughter, clandestine blaze, finland, mikko aspa. Bookmark the permalink. It boggles the mind how consistent CB/Aspa is, CB is BM distilled to its essence. Having said that, i enjoy harmony, deliverers and falling the most. He manages to meld together Hellhammer, the classic Norwegian bands, early Graveland and LLN with such authority and deliberation. Graveland is a really good call. I get cynical about black metal at times and with good reason, but albums like these are a pleasure to discover. What do you think of Graveland in general? i’ve been listening to immortal pride and creed of iron quite a lot lately, some very powerful, almost overwhelming stuff there.